Email us photographs and an account of your cruise from Cape Town and we'll send you a travel voucher. Silversea is an Italian cruise company with its headquarters on Monaco, and has only 6 ships. Let us introduce you to the Silver Wind. This is not a run-of-the-mill cruise liner. Small and intimate, (up to 298 guests in 149 suites), there will not be a fight for a spot next to the pool! Guests will be treated like kings and queens with a private butler, their very own walk in wardrobe and Italian marble en-suite bathroom. The Silverwind offers a more refined cruise experience in a cosy environment (with so few guests you get to know a lot of them). 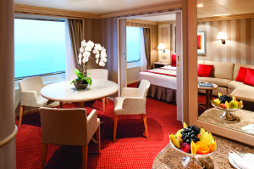 You are spoilt for choice on this vessel when it comes to luxury accommodation. With the majority of the suites boasting their own balcony, it provides ample opportunity to soak up the vistas and admire the marine life. The cruise company has endeavoured to anticipate your every need to ensure a memorable journey. With single or queen beds, loads of cupboard space in the form of a walk in wardrobe, hairdryer, fridge, flat screen TV with a DVD and satellite reception, slippers and gown - to name but only a few of the standard fittings, you will not miss any of your home comforts. (In fact you may be more comfortable than at home!). Not to mention the items you need to choose - the type of pillow you would like; one of 3 brands of bathroom toiletries. And let's not forget the icing on the cake - Drappier Champagne when you board, fresh fruit and flowers. The cherry on this luscious icing? Your very own private butler - at your beck and call, 24 hours a day for the entirety of the cruise. What more can you need? 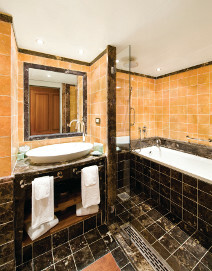 Oh, and if you opt for the Royal, Grand or Owner's Suites, these have a full-size jacuzzi. Can I hear an "ooh" and an "aah"? The Vista suite, which is a comfortable 22 square metres in size and has an ocean view window, is the most basic suite, if you can call all this basic that is! The other alternatives, in order of price, are the Verandah Suites, Midship Verandah Suites, Medallion Suites, Silver Suites, Royal Suites, Grand Suites and the premium Owner's Suites, which all have a private balcony and are up to 78 square metres in size. Consistent with this elegance, prices quoted are all inclusive - all drinks are complimentary, including fine wines, champagne and spirits from all areas of the ship and 24 hour room service. All tips and gratuities are included. The ship has 3 restaurants, a variety of themed lounges and bars, a casino, conference room, internet cafe, spa and beauty salon, fitness centre, library, launderette and a theatre as well as a pool and pool bar. The Silver Wind's Le Champagne restaurant is the world's only Relais & Chateaux restaurant at sea. Nothing is too much effort for the staff on the Silversea's Silver Wind cruise ship - expect complete cheerfulness as you cruise to the paradise of Mauritius or discover South Africa's east coast in utter luxury. Silversea offer a more intimate cruising experience, with less guests than there are on the gigantic cruiseliners. These are just a few cruises to whet your appetite. Lots of options are available (including international cruises), so email us at cruises@southafrica.to for your quote. 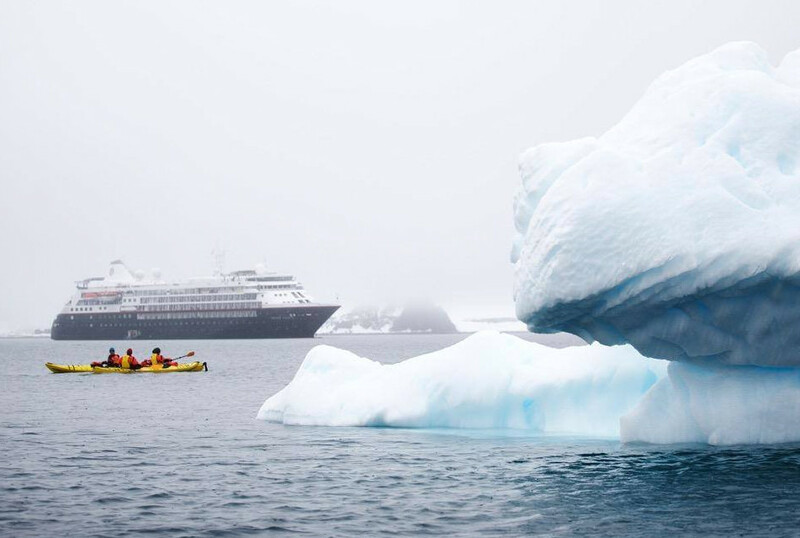 In Dec 2016 Silversea won the Cruise Critics editors' awards for bet for adventure, best new luxury ship (the Silver Muse) and best destinations. In November 2017 the conversion of the Silver Cloud to ice-class was completed by the Palumbo Malta shipyard, with an ice-class bulb being aded at the front, and the hull being reinforced. The ship's new sonar will help detect underwater ice; whilst ten kayaks and 16 zodiacs have been added to aid exploration. Nov 2017. It was meant to to be the cruiseline's inaugural cruise to the Antarctic from Buenos Aires on the Silver Cloud; but ater first being delayed due to bad weather, when the fuel pump broke after a few days out, the captain decided to cancel the cruise. Silversea refunded all passengers, paid for their flights back, refunded flights to Buenos Aires, and provided a discount for the next cruise booked with them.